The Nortel BCM 450 is an all-in-one, affordable platform for converged voice and data communications; ideal for medium-sized businesses and branch offices with 30-250 users. The unified communications capabilities of the Nortel Business Communications Manager 450 include unified messaging, message forwarding*, Meet-Me Conferencing, Computer Telephony Integration (CTI) and Intelligent Contact Centre functionality to connect people quickly - enabling businesses to gain a competitive edge in an environment where speed, simplicity and savings are integral to success. Other advanced applications of the Nortel BCM 450 phone system include robust telephony features, voice messaging, IP networking, Internet access, mobility solutions and IP telephony. With an easy-to-use and highly flexible architecture, the Business Communications Manager 450 enables mid-size sites to benefit from convergence capabilities that were previously only available to much larger organizations. The Nortel Avaya BCM 450 comes with hundreds of telephony features and a full suite of integrated applications pre-loaded "in the box" - as your business needs evolve, you can easily activate more capabilities. Rich multimedia applications can be activated to voice-and chat-enable a website. These features are all orderable via simple software keycodes and do not require extra hardware. Nortel BCM 450 features include: 4 slots to accommodate Media Bay Modules; 1 OAM port used for direct connection of a computer running administration software such as Element Manager; 2 LAN ports; 2 USB 2.0 ports to connect USB storage devices; 1 DS256 jack to connect a BCM expansion cabinet; Auxiliary ringer jack, page relay jack, page output port; Music on hold port. Platform Status Monitor monitors CPU load, memory load, HDD space, temperature, fans, power, network throughput. Two System Status LEDs (Power and Status) BCM Monitor monitors overall system status, IP telephony functions, utilization of resources, operation of telephony applications and status of PRI, BRI and IP trunks. Three hard drive activity LEDs (HDD1, HDD2, RAID) (Note: RAID LED not supported on BCM450 Rls. 1). Note: We will consult you regarding your needs and the exact system configuration. Nortel BCM 450 / Business Communications Manager 450 - 6.0 System Standard. Features include 4 slots to accommodate Media Bay Modules; 1 OAM port used for direct connection of a computer running administration software such as Element Manager; 2 LAN ports; 2 USB 2.0 ports to connect USB storage devices; 1 DS256 jack to connect a BCM expansion cabinet; Auxiliary ringer jack, page relay jack, page output port; Music on hold port. Nortel BCM 450 / Business Communications Manager 450 - 5.0 System Standard. Features include 4 slots to accommodate Media Bay Modules; 1 OAM port used for direct connection of a computer running administration software such as Element Manager; 2 LAN ports; 2 USB 2.0 ports to connect USB storage devices; 1 DS256 jack to connect a BCM expansion cabinet; Auxiliary ringer jack, page relay jack, page output port; Music on hold port. Nortel Business Communications Manager 450 - 1.0 System Redundant. Features include 4 slots to accommodate Media Bay Modules; 1 OAM port used for direct connection of a computer running administration software such as Element Manager; 2 LAN ports; 2 USB 2.0 ports to connect USB storage devices; 1 DS256 jack to connect a BCM expansion cabinet; Auxiliary ringer jack, page relay jack, page output port; Music on hold port. Nortel BCM 450 / Business Communications Manager 450 Expansion Cabinet with Universal Power Supply. Connects to the expansion port on BCM 450 Main Unit; Requires Expansion Port Keycode to activate expansion port on BCM 450 Main Unit; Supports up to 6 Media Bay Modules; Wall and rack mountable with optional accessories. Compatible Media Bay Modules include: 4x16 Combo, 8x16 Combo, ADID4 and ADID8, ASM8+, CTM4 and CTM8, DTM, BRI, DSM16+ & DSM32+, GATM4 and GATM8, GASM8, R2MFC, FEM. Note: This Expansion Module does NOT include the BCM 450 Platform. Nortel BCM 4x16 COMBO Trunk Module Release 2. 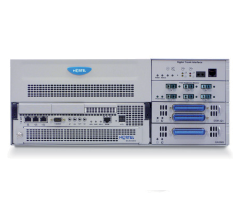 The Nortel BCM CMB4x16 Combo Media Bay Module provides: 4 CO Lines, 16 Digital Stations. Nortel BCM-ADID4 Analog DID Media Bay Module. The analog direct inward dialing (ADID4) MBM provides an interface for four or analog public switched telephone network (PSTN) lines; Supports both pulse and tone dialing as well as disconnect supervision, and direct inward dialing call progress signaling as described in standard TIA-464C. Nortel BCM ADID8 Analog DID Media Bay Module. The analog direct inward dialing (ADID8) MBM provides an interface for eight or analog public switched telephone network (PSTN) lines; Supports both pulse and tone dialing as well as disconnect supervision, and direct inward dialing call progress signaling as described in standard TIA-464C. Nortel BCM DSM16+ Digital Station Module. The Nortel BCM Digital Station Module 16 supports 16 digital telephones through one RJ-21 connector; Set the double density switch to enable the DSM to carry 16 extensions over a half DS30 bus; If required, install a second DSM16(+) and set the double density switch to occupy the second half of the DS30 bus to expand the number of extensions to 32. Nortel BCM DSM32+ Digital Station Module. The Nortel BCM Digital Station Module 32 supports 32 digital telephones through one RJ-21 connector; A DSM32(+) operating in single-density mode occupies two DS30 buses; Set the double density switch to enable the DSM to carry 32 extensions over a single DS30 bus. Nortel BCM DTM Digital Trunk Media Bay Module - T1/PRI. Connects to a standard digital PSTN T1/fT1, E1/fE1, or PRI ISDN line using either a digital or PRI line; Also supports DASS2, DPN22, Q.SIG, and MCDN over ISDN; The DTM connects a T1 or PRI circuit to the BCM system; T1 circuits provide 24 digital channels to the PSTN, while PRI circuits provide 23 digital channels to the PSTN. The front bezel of the DTM has an RJ-48C connector that connects the DTM to the service provider connection point; The faceplate also has a set of monitor jacks you can use to monitor the span. Nortel BCM 450 / Business Communications Manager 450 5.0 Replacement Hard Drive - (NTC03120SXE6). Nortel BCM 450 ./ Business Communications Manager 450 1.0 Replacement Hard Drive - (NTC03120SYE6). BCM450 consolidates voice, fax and email messages onto users' PCs, laptops or PDAs, managing them through one standard application such as Microsoft Outlook or Exchange. Important messages are sent and received regardless of device - a real time saver and productivity booster. Voice, fax or text messages can be forwarded to a wide variety of email clients and PDAs keeping employees connected to customers and each other wherever they go. You can attach a compressed WAV file to the email, so users can play the voice message or see the fax message on the destination device. Its simple to install with no add-on client software or firmware required. Simply activate Message Forwarding with the existing BCM Unified Messaging authorization codes. Reduce your conferencing expenses by eliminating the need for external services. Parties can easily establish a teleconference for up to 120 participants using the CEC, with 60 simultaneous participants on one conference. A Rich set of user controls enables the "chairperson" to start, stop, secure and control the conference. A flexible feature ideal for larger conferences, specifically those involving outside suppliers. Simple to activate, set up and manage, CTI enables you to use third-party, PC-based applications to control telephone services, such as a click-to-call company directory or automatic screen "pops" of a customer's account status alongside a customer's call. Direct clients and customers to the right contact quickly - increasing customer satisfaction and business productivity. Advanced reporting and multimedia applications maximize customization and flexibility. Even if employees aren't there to answer the phone, they can still get the message; callers can leave information in a mailbox for selected users, departments or groups of users. Employees can record personalized greetings and enjoy anywhere-anytime password-protected access to their messages marked with calling line ID, time and date of the call and priority level. This always-on-duty "administrative assistant" answers calls to your business with personalized greetings and menu options routing calls to the right people, departments or voice mailboxes. Provisioning less overhead for staff and satisfied customers. The Advanced Paging Productivity Pack (APP Pack) is a suite of advanced applications designed to increase employee productivity, improve customer service and streamline business processes - virtually anywhere paging and text-messaging are used. Features include One Button Paging and Text Messaging, Customer Assistance Paging and Scheduled Announcements. It's easy to get the team together for a meeting at the spur of the moment, regardless of where they're located. Simply initiate a teleconference call with up to 120 total participants using the CEC, with 60 simultaneous participants on one conference, without the need for a conference operator or service. Whether your employees are in the office, nearby or even traveling, BCM450 has a full suite of mobility offerings to choose from including digital and IP wireless handsets or even PDA and PC-based soft-clients. Regardless of location, your employees can stay connected to customers and each other. Better understand and optimize your call flows - for improved customer service and cost savings. The basic version Activity Reporter is an on-box reporting system that provides reports on Business Communications Manager telephony data metrics (e.g., Call Accounting, Auto Attendant Call Routing and Voicemail). The full version is an off-box system offering more advanced reporting capabilities and greater flexibility, enabling you to organize information the way you want. The Nortel BCM 450 (Business Communications Manager 450) can be configured in in many different ways, we suggest you Call us TOLL FREE at 1-855-929-9199 so we can advise you on the best configuration for your needs. Call us TOLL FREE at 1-855-929-9199 to purchase the Nortel BCM 450 Telephone System. The Nortel Business Communications Manager 450 - the unified communications solution that gives you an edge on your competition!